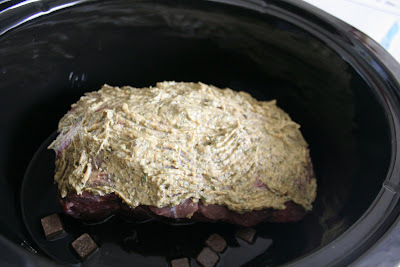 So a couple of years ago I was looking for an herb rub for Prime Rib, and after combining a couple of recipes together I came up with this, but I can't tell you measurements or anything since I just kind of go by smell, feel, and color. :-) Helpful. I know. I've discovered that this is good on most roast, be it prime rib or whatever. 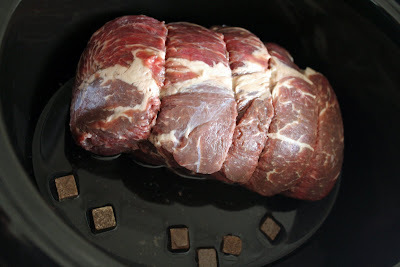 If you want it really flavorful, I stabbed my roasts (prime rib) with knives and then put the rub on and then wrapped them in saran wrap and let them marinate for a day or so before cooking. 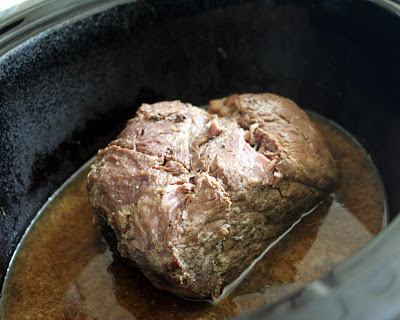 I used it the other day on this sirloin tip roast, but I only had the cubed boullion so I stuck it in the water and not in the rub. When you have mixed everything together it should feel a lot like a paste mixture and look more greenish-brownish than in this picture. Kind of like, err....nevermind.